At the last minute we were able to get tickets HOME for Christmas!!! We were so glad to be able to go home, but it was a short whirlwind trip to visit all the family and friends we could! To the left is our little Charlie Brown tree, but if you put enough ornaments on it, it looks alright. And we were obviously packing for the upcoming trip to Michigan on the 21st when this was taken. We woke up early on the 21st for our trip to take the dogs to Heather and Mary's houses and then drove to the airport to park. We actually made it to the airport early and had time to grab some breakfast before boarding the plane. Our flight w as uneventful and we landed early in Detroit; we were not so lucky on the flight home. We spent the remainder of the 21st and 22nd with Josh's family. We were so happy that some of our friends went out of their way to visit us at Peggy's house;Brian, Hosha and Erica. It was great to see everyone again, even thought we were just here in September for a visit. Aleecia has grown even more and talks a lot more, she just turned 2. The rest of the nieces and nephews are getting big, some are teenagers, crazy! This makes us feel old. But Josh had a great time wrestling and playing with the kids, Josh is the biggest kid himself; we also went bowling at the persistence of Alex. That was a fun evening, it has been years since I last bowled, and I am just as bad as always. Josh beat all of us every game...argh the bragging he got to do. The next morning we were up early to go to my parents house for the Maher Christmas. We arrived before 9am and helped my mom get things around (sort of) for the festivities later that evening. My good friend Robin and her two boys Gideon and Orien came to visit us, it has been over 2 years since I have seen her and I miss her so much!! My sister and Cody came around 3:30 and we sat around and talked with them until company started coming around 5. Laura didn't know we were staying until the 26th, and she thought this was the only day she was going to see us, tee hee! The Maher Christmas was lots of fun, as always! My cousins get older and it's great to talk to them about their lives and accomplishments :) My cousin Amanda is talking about a backpacking trip through Europe and her brother Jim has a really awesome girlfriend Noc who I really enjoy talking to. Meghan, the closest cousin to me in age has two children Jenna and Kyson who are getting so big! Those two kiddos are hilarious; the last time we saw them was in 2007 when we were home and Kyson was an infant. And I am always impressed by my cousin Courtney who is a senior this year in high school considering going to school at WMU next year. As always, the evening flew by and I barely got to talk to everyone for a few minutes. We said goodbye's and went to bed to get up and do it all over again on the 24th, Christmas Eve. The best part of the Maher Christmas was hanging with my sister, she gave me her gift to me that night because she didn't know that we were surprising her and staying through the 26th! So I was tickled the entire night we were going to surprise her. We had breakfast at my parents house on the 24th and as always dad gave me a bunch of books to take with me, so I was stocked up for a few months. Mom made a great breakfast, we packed up and were on our way again. Next we visited Steve's house, who is Josh's step-dad and his family Lori, DJ, and Kaylee. Kaylee had just been diagnosed with type 1 diabetes and she had spent a lot of time in Bronson hospital in November. It was good to see her looking happy and healthy! I always enjoy going to their house; both Steve and Lori always make us feel at home and are so glad to see us. We were able to spend a few hours at the Brenke house before we left to go to Peggy's for Christmas Eve, plus we wanted to stop at Josh's cousin, Gina's house on the way to Peg's... whew! After a short visit with Joe and Gina we headed over to Josh's mom's house for their family Christmas, which is always celebrated on Christmas Eve. 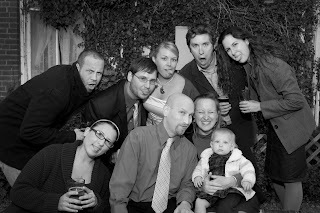 All of the Shawn Mason family was there, Josh and I, Miranda and Aleecia. There was a lot of Wii bowling, I wish I was as good at regular bowling as I am at Wii bowling . We got Peg a wireless print server for Christmas that Josh couldn't get to work. Josh spent hours on it, and it never connected to the router. That was a bummer! She had to send it back. The Shawn Mason family said their goodbye's and all left early on Christmas Eve; we spent the rest of the evening with Aleecia, Miranda and Peggy playing Wii bowling. I am starting to like the Wii a bit, maybe someday we can get one. On Christmas morning we had to get up early to drive to Kalamazoo to my sister's house for the Bob Rainey family Christmas, then drive to Newaygo for the entire Rainey family Christmas. We said our tearful goodbye's to Josh's mom and got in the car for the drive. My sister didn't know that we were going to be at her house for Christmas, so it was really fun to surprise her!!! I love surprises! She was in the bathroom when we came into the house and when she opened the bathroom door and walked out she spotted Josh! yay! fun! It was great to have the whole family together on Christmas morning! Dad had tagged all of his gifts to mom with funny things like; To: Ma From: sled Jockey. It was pretty comical! She got lots of gifts from Rite Aid, haha! (they got a computer as their gift to each other). After eating a yummy breakfast cooked by dad on Laura's new griddle, we got back into the car for the 2 hour drive to Newaygo. We arrived first at the Doug Rainey family house and shortly after us everyone else came too! The next morning we woke up, had breakfast and packed up to head to the airport. Due to the festivities the night before, the next day was pretty brutal for me, then our flight was delayed and eventually after being de-iced during the blizzard, took off and landed just fine. We didn't get home until 9pm after picking up two very excited dogs who were very glad to see us. It was such a great trip and we were so glad we made it home. Happy New Year! Here are a few more photos from the trip. I did a lot of trees, my favorite, its my Christmas forest!! At the last minute Josh and I were able to get tickets home for Christmas!! Both of our parents gave us some money to fund the ridiculously expensive flight home and with their donations we were able make it work! Fortunately, we have some great friends who will dog sit for us this Christmas; we have watched their dogs many times over the holidays when we stayed here, its always been fun to add a "guest" to the mix on Christmas, fortunately they are staying here this year. Rock can tell something is up since the suitcase is in the living room, and she is acting weird. Plus they both got much needed baths yesterday and that always keys her in that she is going to be left somewhere. We will be leaving bright and sunny Colorado for cold Michigan winter weather; but at least it will be festive and a white Christmas :) I think the storms are over in the Midwest and I hope our plane lands on time. At least its a direct flight. We will be surprising my grandparents this Christmas, and maybe some other family who doesn't have facebook and I cannot wait to see their reactions!!! I miss my grandparents SO much and am so grateful they are still happy and healthy at their age. New Item at Hip-Threads.com! 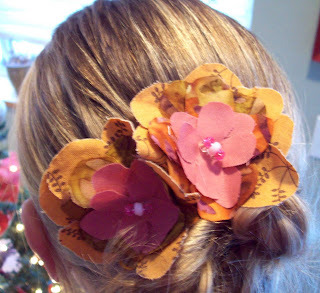 Fabric flowers hair accessories. Ever since I decided to grow my hair out, I have been in the mood to create hair accessories and I *love* the way these turned out. I comically learned the "right" way to make these hair accessories, when I had the idea one night to start hot gluing random items to bobby pins. But they didn't seem to stick on properly. I knew I had to be doing something wrong, there had to be a certain type of bobby pin I needed to use, right? Then I remembered one of my friends, Kelly of Kreated By Kelly (check out her awesome shop here!) makes hair accessories and I knew she would have the answer. I sent her an email and quickly received one back from her, I needed to use a bobby pin with a metal gluing pad on the black. Duh! I knew it was going to be something silly. I asked her for her recommendation and she suggested Thunder Rock Alley 21(find her shop here, and I bought lots of supplies all were great!). Quickly I ordered my supplies from her and received them last week. 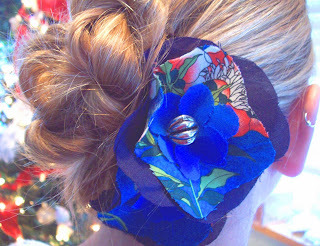 Finally, this weekend I had the time to start creating my fabric flowers and hair accessories. I decided to google "how to make a fabric flower" for some ideas, even though I had some of my own on how to make them. I found an article (click here)which I thought was great despite the relatively low rating on eHow.com. It gave me some additional suggestions and I started cutting. After several hours I had made 5 wearable and sell able sets of flowers. They all are attached to a nickel free metal bobby pin, and have a bead centerpiece. Very cute! I have several available in my etsy shop (here) and on my website (here). 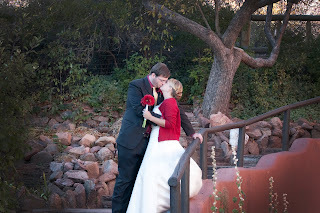 The hardest part was finding the right photographer. 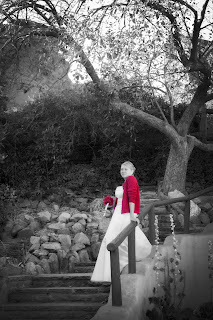 The first thing that I did was ask all of my girlfriends who their photographer was, as they were all married in Colorado and all had beautiful photos! 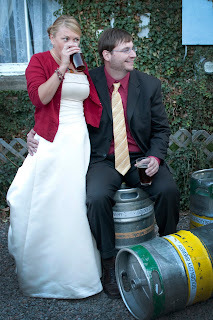 I was able to check their photographer out online and see the sample photos on their website and one photographer really stood out; Benjamin Buren of Alive Studios. 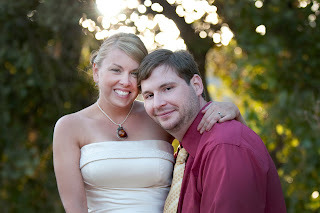 He photographed Heather and Russ's wedding, they are good friends of ours. One night at our weekly girls night Heather got out her wedding album for us to look at, and her photos were in-cred-ible! It sealed the deal for me and I contacted Ben immediately! 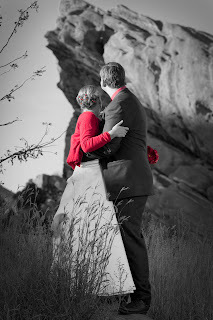 We were able to schedule a weekday session the day before our anniversary and negotiated a lower price. I also wanted to get the CD with all the photos to keep, which comes at a higher cost for photographers (as it probably should). 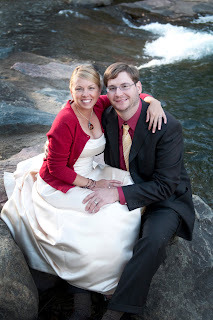 Ironically, our friends Laura and David were getting married Saturday October 17th in Estes Park, and our anniversary is the 16th, so we scheduled our photos on the 15th. We were SO glad that it worked out this way, as our great friend Geri and her boyfriend Wayne flew in for La ura's wedding. 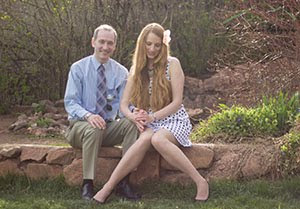 Geri usually stays with us when she visits Colorado; she, Josh and I are three peas in a pod and get along great! (and i miss her!!!!) They were able to share the day with us and it was great to have help getting into my dress, making sure my makeup and hair looked OK, and just another girl to share the fun with! 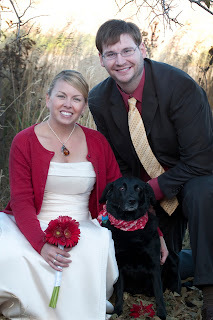 Plus, we really wanted our dog Rock to be in the photos with us, and they were a great help taking care of her while we were taking photographs. 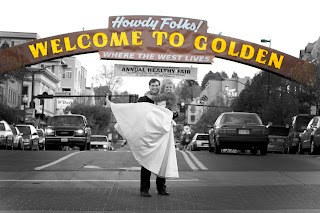 I wanted to take photos at both Red Rocks and in downtown Golden. Both of those places are very dear to our hearts with lots of great memories and they both offer incredible scenery and views! 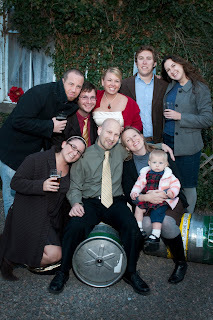 Then I wanted to end the shoot at Golden City Brewery (click for their link) with all of our friends for a group photo! Golden City is a great local brewery, they brew a garage and they have a very small indoor area to buy beer with a few seats, then a larger outdoor area with picnic tables to sit outside and drink your beer in the Colorado sun. They don't offer food, just great beer! Anyway, this is a place that we love and our friends love and we all *love* good beer, so it was very fitting to take some photos here. 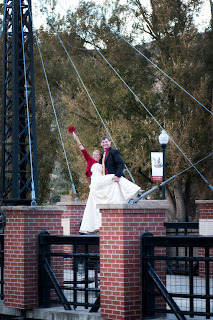 The photo shoot was a lot of fun to do, especially because there was no actual ceremony or expectation, except to take great photos. 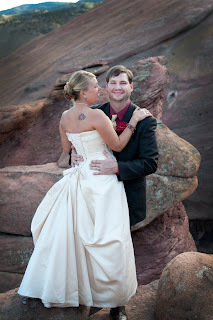 We spent most of our time at Red Rocks getting some incredible shots on the rocks, of the front range, and with the amphitheater behind us, and we also took pics with Rock in them. Next we drove to Golden and took some photos on the bridge where Megan had taken our "engagement pics" over 5 years before. We had some great shots with Ben by the water, then he had us go onto the suspension bridge in Golden, and stand ON TOP of the table which is on the bridge for some shots. 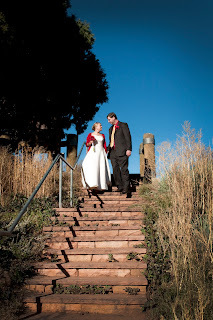 He also took some photos of us right in the middle of the main road in Golden, which turned out really cool! Lastly we walked over to the Brewery and took some awesome group shots and shots of us drinkin' some beers, which is very *us*. All in all it was a great day, and I highly recommend Ben and Alive Studios for any photos in the Denver/Boulder area, he is incredible! Here are some more of my favorite shots!